A pre-amplifier circuit-integrated computerized attenuator, new LECUA* 1000, equivalent to that used in the higher grade L-590AXII model is mounted in the volume adjustment unit, playing a critical role in the pre amplifier section.The renovation was made to the buffer circuit input stage to allow smooth volume adjustment in 88 steps thereby minimizing the deterioration of sound quality. Additionally, a 3D layout has been introduced in the new LECUA1000 allowing the substrates to be placed in three dimensions. The attenuator circuit is connected directly to the amplification circuit to make the shortest signal routes and improve efficiency. The LECUA1000 has exceptional durability and is capable of controlling the changes in sound quality that may occur due to external vibrations or sound volume adjustment. *LECUA is an abbreviation of Luxman Electric Controlled Ultimate Attenuator. The ODNF* , LUXMAN original amplification feedback circuit, features a fast primary slew rate and an ultra-wide bandwith achieved through the feedback of distortion components only from the output signals. 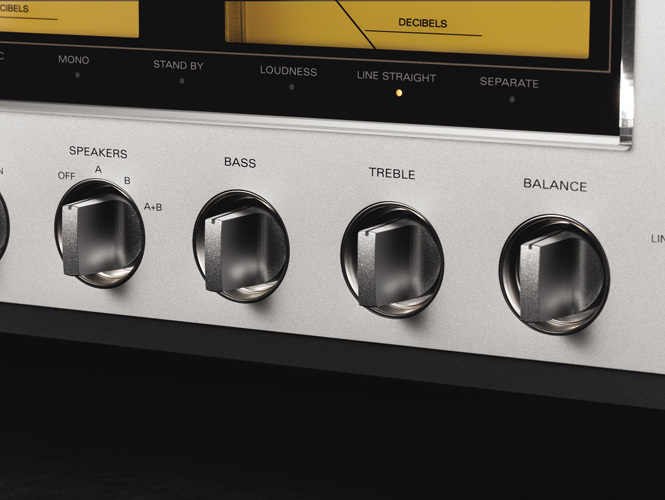 The L-550AXII is equipped with the latest version of ODNF - Version 4.0 - in which the distortion characteristics at high frequencies as well as the S/N performance have been significantly improved. Version 4.0 ODNF also features a large scale power amplifier with a parallel push pull structure where 3 stage Darlington is used. Both of these features are inherited from the M-700u power amplifier and the higher grade integrated L-590AXII. A rated output of 20W +20W (8Ω) of pure class A amplification achieves a mellow, expressive sound with a heightened sense of density with high drivability to speaker systems. * ODNF is an abbreviation for "Only Distortion Negative Feedback". The large capacity, low resistance speaker relays are connected in parallel in order to transmit the powerful drive force that is generated by the high inertia power supply circuit and the large scale output circuit without loss. Connecting directly to the speaker terminals in this way significantly improves the damping factor from 160 to 200. Original LUXMAN OFC wires are used in the internal wiring of the L-550AXII achieving a smooth signal transmission due to the spiral wrap shielding on each core and the non-plating process on the core wire. 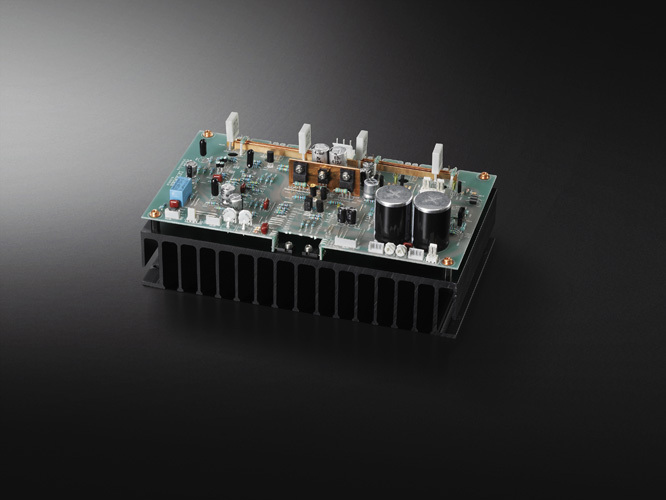 The L-550AXII is designed introducing many custom-built parts and sophisticated technologies including newly developed high sound quality, low height block capacitors. The front panel features a newly designed, highly visible meter panel that expresses the identity of the MK II model with a ‘pointer type’, LED lit analog meter. The tactile machined aluminium control knobs enable greater accuracy of selection.